Let me know the last name and how you want it to read EXACTLY on the sign below. You can add 'The' or 'Family, etc. I will make it exactly as you list it. 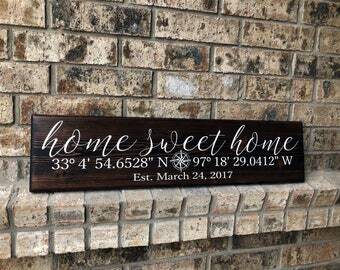 • Handmade, painted wood sign. Lettering is painted on. • Made with new solid pine wood. • Back stained, Stamped with our logo. • Recommended use under Covered Area/Porch. • Jute Twine attached for easy hanging. ** I do not accept returns/exchanges on customized/personalized signs. *Pictures are property of The Wood Grain Home. Please do not copy my pictures without my permission. • Make sure your Etsy account information and address are up to date. If you need to send it as a gift, make sure to change the ship to address because shipping charges vary from location to location. • Please note that wood/new wood has natural imperfections such as knots, cracks which make each sign unique and different. Sign colors may also differ due to lighting, screen resolutions and wood. Wood is from nature, so stain adheres different to every piece of wood. No two signs will/can ever be identical. 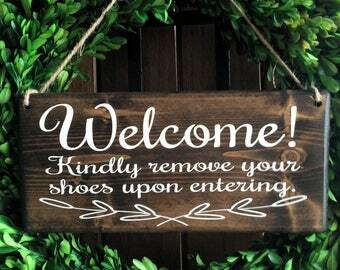 • Please read all Shop policies before placing an order. 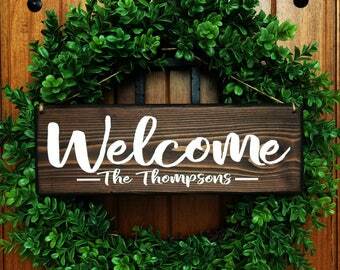 I do not accept returns/exchanges on customized/personalized signs. All major credit cards Visa, Mastercard, American Express, Discover and Etsy gift cards accepted. Full payment must be made before I begin to work on your order. Refunds and order cancellations can be done within 24 hours of sale only. Once I begin your order, I cannot cancel. Refunds and order cancellations can be done within 24 hours of sale only. Our items are painted (no vinyl or stickers) and some are distressed for an aged and worn quality. No two items are alike and we do not attempt to cover or patch up any knots, dents or cracks within the wood itself. We are selective in our wood choices but since wood comes from Nature, no piece will ever be perfect and flawless. 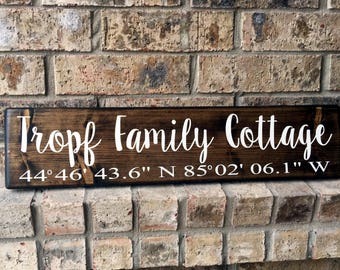 Wood signs can vary by 1". Colors in the pictures listed may not be exact. Different wood batches take stain differently including the color stains. In person there may be a slight variation from dark to light. We do our best to depict the true colors of each image but it does not always translate accordingly. Each wood piece varies. We will not refund orders based on this. Refunds of merchandise cost (shipping costs non refundable) for damaged products/returning items will be issued from 7 days after receipt. Merchandise needs to be returned in original packaging within 7 days after receipt of merchandise to receive refund or replacement product for damaged goods. No refunds, returns or exchanges on Custom orders with names, dates, special requests, etc. I do not accept returns simply because you "just do not like it." I offer mock samples, previews if requested when order is customized. Customer is responsible for return postage/shipping if returning your sign. Keep in mind that I package my items carefully and with care to hopefully arrive safely. It is not always my fault if an item arrives damaged. Let me know if your item arrives damaged asap. If you order a Customized/Name Sign, I follow directions exactly as listed. I do NOT refund/remake signs based on errors made on your part. It is the buyers responsibility to make sure everything is correct. If I make an error that is my fault, I will gladly remake you your item with detailed pictures as proof of my error. If the buyer requests a proof beforehand or has a special customized product, I will send a proof. If buyer approves it or okays to proceed, then that means everything is okay to continue. If errors are found later, whether made by myself or the buyer, it will be the customers responsibility since it was approved. I do not offer refunds, returns, or replacements if the buyer approved the proof and said it was okay to continue. It is the buyers responsibility to review the proofs thoroughly. I cannot offer refunds on customized or personalized items. PLEASE contact shop for any reason immediately to address any problems when your sign arrives. If your sign arrives to you damaged for some reason, please message me ASAP and we will work something out. If your package comes back due to an incorrect address, refusal or zip code, I can re-send it for another shipping fee. (Etsy automatically uses the address you have provided on the Shipping label). I am not responsible for lost packages due to a mistype or incorrect address on your part. Please make sure all is correct on the shipping address information. **PLEASE make sure your address is correct! I cannot make changes to the address once the order has been placed due to tax purposes. You will have to reorder it again if you need to make a change. If you'd like to purchase insurance, let me know so I can charge you. I am NOT responsible for items lost/stolen that are marked DELIVERED. If your item is marked Delivered, please contact your local post office. It is hard to prove it on my end if it’s marked Delivered. I am also not responsible for undeliverable items if everything on my end is correct. I will reship if the item gets returned to me for another shipping fee, otherwise I will refund only the sign cost (minus the shipping fees). Keep in mind that all signs are made of wood which is natural. I do apply polyurethane to protect the paint for outdoor use. I cannot guarantee that extreme temperatures will not cause damage to the letters and paint. Please use your best judgment in freezing cold temperatures and extreme hot weather and bring your signs indoors in such cases. The wood comes from nature however the paint does not. I cannot predict that no damage to the lettering will occur in extreme elements. Use at your discretion in harsh weather. For any other questions or concerns please contact me directly and I will work with you. 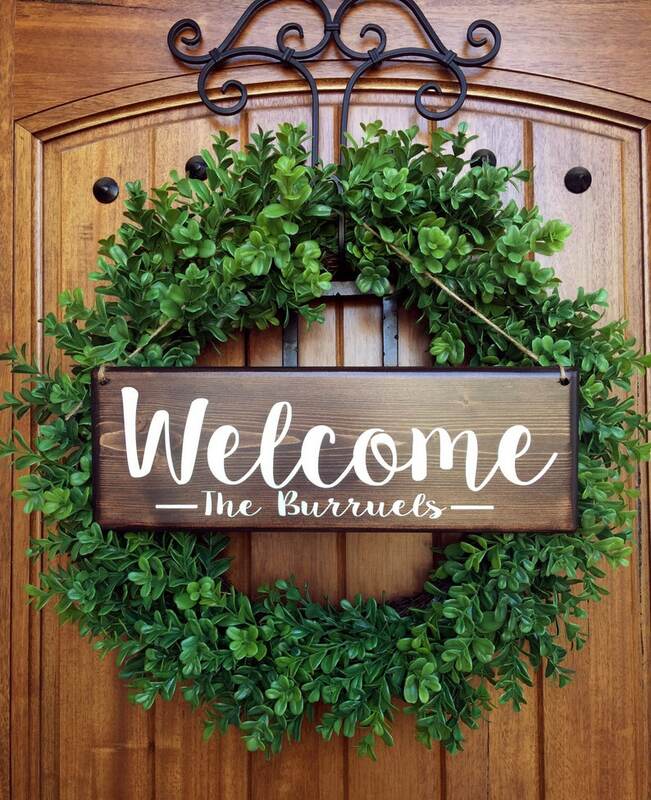 All signs are made to order completely from scratch. I never ship items late, so please be patient as I am working as fast as I possibly can. All items ship via USPS using with a Tracking & Delivery confirmation. I cannot do RUSH orders unless otherwise discussed and arranged. Putting a comment on the NOTE TO SELLER, will not bump your order to the top before others. Contact me if you have question or concerns regarding when your item will arrive or by when you need it to make sure you will get it on time. *Shipping costs are automatically calculated based on your zip code and weight of the item once packaged. (Except on the small Flat rate packages) To calculate your specific shipping costs, simply enter your zip code and you can see exactly how much your shipping fees will be. I ship all signs using USPS Priority Mail and can take between 2-4 days after they have been shipped to arrive. **PLEASE make sure your address is correct! I cannot make changes to the address once the order has been placed. You will have to reorder it again if you need to make a change. I am NOT responsible for items lost/stolen that are marked DELIVERED. If your item was marked as Delivered, you can contact your local USPS post office. If you'd like to purchase insurance, let me know so I can add it before ordering. I am also not responsible for undeliverable items if everything on my end is correct. I will reship if the item gets returned to me for another shipping fee otherwise I will refund only sign cost. Please make sure your shipping address is CORRECT as I will not be responsible for items shipped to a wrong address due to an incorrect address on your part. Shipping labels print with whatever address you provide. It is the buyers responsibility to make sure everything is correct. If you order multiple items, I will reimburse you the shipping overages after your signs go out. It's hard to determine the final weight beforehand. Some of our signs are made to look aged, worn and distressed. No two signs will ever be exactly the same. The distressing for each sign will differ and is done in no particular pattern. It will differ based on wood grains, knots and character within the wood itself. This is not a defect or damage but rather made to look like the sign has naturally weathered over time or has that old vintage feel. There will be areas of the sign where paint will be sanded off and this will vary with every sign. A comment and question I get often. Are those stickers on the sign?? No they are not. I promise. All sign lettering is painted on the sign with a brush using stencils. Polyurethane is applied after to seal and protect the paint for durability which can make the lettering appear and look like stickers. Why the long turnaround/production time? 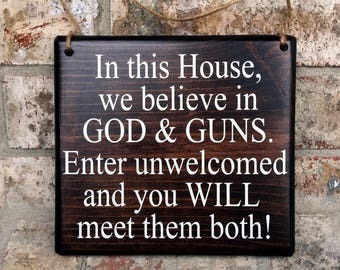 We make every single sign in our home. We cut, sand, stain, design, paint, seal, package and ship all the signs ourselves. We try our best to make them as fast as we possibly can. Orders come in daily and as much as we'd like to make 100 orders in one week, it's humanly impossible. We're completely handmade, not mass produced made by a machine. The shipping seems high? Is that correct? Yes. Keep in mind Wood is heavy. We weigh each sign/package and pre-set the weight on the listing. Depending on where it's going to, that's how the shipping costs are calculated. The further from Texas, the higher the shipping cost. It's all based on weight and location.